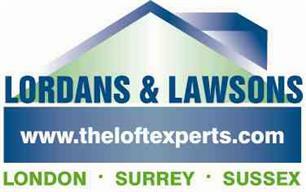 Lordans & Lawsons Ltd - Builder based in Crawley, West Sussex. The Loft Experts realise that having a loft or garage conversion is probably one of the largest investments and home improvements you'll make to your home in today’s current economic climate and that is why we are dedicated to giving you more than 'just a room in your loft or garage that most builders would wish to give you. We are here to understand your personal needs at home see the potential your loft or garage has and transform your living conditions at home so effectively that you may never need to have the massive expenditure and stress of having to move again! With over 20 years of experience, we at the loft experts obviously have done this successfully to over a thousand homes and families and they have all had "more than they ever expected". Totally dedicated to just loft and garage conversions means that we can give you 110% when it comes to building your new room(s). Which means we can start and finish your loft or garage in a realistic time scale with no stopping or starting or disappearing for weeks on end, like some other builders. Just pure hard work and dedication means the majority of our lofts are completed within 6 weeks and is totally project managed by us, so you can carry on with your lives without any worry or stress caused by having building works done to your property. Having our own people means that we can give you 110% at all times, so we never have to let you down, such as in an emergency.